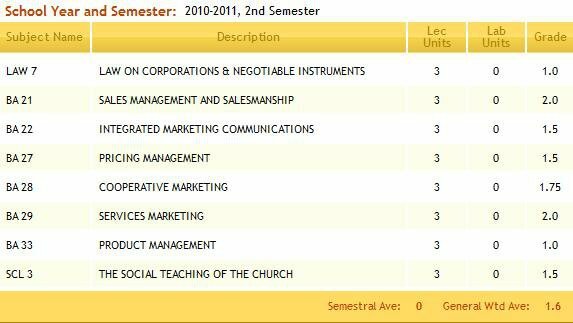 Awkward Me..: My 3rd Year Second Semester Grades! My 3rd Year Second Semester Grades! And there you go, my grades. So far, I got two 2.0. Thanks to Sales and Services :/ There’s no semestral ave yet, but I have computed it and it’s 1.53. 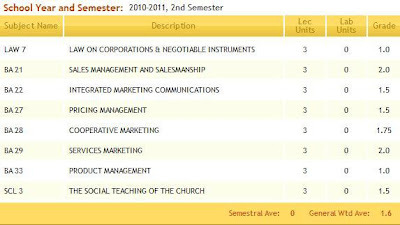 I added it to my last sem’s ave which was 1.4 (not yet sure with the second digit) and I got 1.4 something! Yeah baby, still a Dean’s Lister! So happy for still making my parents proud :D One more year! !